More than 400 years ago, during Japan’s so-called Warring States Period (Sengoku Jidai), a fortress known as Hanamuro-Jo (花室城), stood a couple of hundred meters east of what is now the Hanamuro Intersection (ko-saten), not far from Tsukuba Center ( in fact this was one of a string of such structures which once dominated this area). No one is certain exactly how many years this fortification was operative, as there are no extant records bearing this information, however, there is documentation of Hanamuro-Jo having still existed in 1569, as battles raged for control of this region. Even if it did actually survive the fighting of those years, it still would not have lasted long into the Edo Period (1600-1867), during which a unified Japan was consolidated under the Tokugawa Family. This is because the One Domain-One Castle Law (Ikkoku Ichijo Rei , 一国一城令) of 1615, permitted only one fortification to survive in each HAN (domain). The castle selected to be given a lease on life in this area was the Turtle Castle (Kijo , 亀城 ) of the Tsuchiya Clan, in Tsuchiura (Tsukuba was NOT as many believe, part of the Mito Domain), while any other fortifications that still existed had to be completely dismantled. No matter when or how Hanamuro-Jo met its fate, one thing is for sure — it has disappeared with hardly a trace. In fact, the hill upon which it once stood is now divided disrespectfully in two by a road (the Tsuchiura Gakuen Line) which was built right through it! The northern side is now covered by homes, fields and a Buddhist temple ( Kakuo-Ji), while on the southern side, where the fortress` main structure once stood, there are now some vegetable patches. There is no sign, or any other indication that Hanamuro-Jo was ever there. 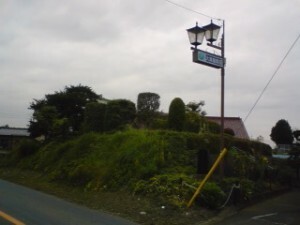 A bit to the West however, past the traffic light near the now defunct Hanamasa Grocery Store, lies a grassy knoll (across from the small tatami factory), where memories of Hanamuro Castle are kept alive. 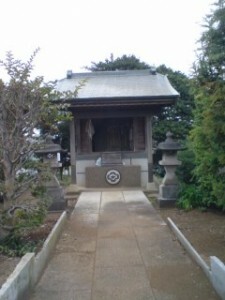 On top of this little green island of a mound sits a small shrine which houses a large unengraved, stone slab, along with many smaller stones and pebbles. Offerings of sake, rice-cakes ,etc., and numerous strands of SENBA TSURU (one thousand cranes) can always be found placed in front of or inside the wooden structure, as worshipers come to beseech and give thanks to the MIGAWARI AMIDA (the Scapegoat Amida), who has resided on this little hill since the days of Hanamuro-Jo. Amida is the Buddha of Infinite Light, who rules the Pure Land, and is one of the most popular figures in Japanese Buddhism, and the central figure of the JODO and JODO SHIN Sects. His name is invoked by believers who seek his aid, or wish to enter his Western Paradise. Migawari (身替り) can be directly translated as a surrogate, or taking the place of or standing in for another. 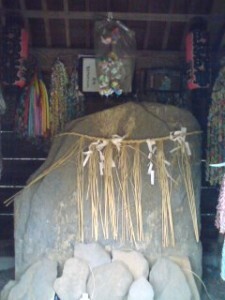 I have translated this as SCAPEGOAT, since the devotees of this deity which resides near the ruins of Hanamuro Castle, believe that their pain, injuries, or other forms of suffering are transferred away from them and taken on by the stone on the hill, just as the sins of the ancient Israelites were cast away into a goat. There are many stories extolling the powers of the stone. The most dramatic I have heard were years ago from old Mr. Ohtsu, a descendant of the family which kept the Hanamuro Castle as Vassals of Lord Oda. He recounted how he had accidentally fallen into a fire he had going (the same fires which still foul our Tsukuba air) and miraculously emerged completely unscathed. He later noticed that the stone slab had turned completely black. In disbelief, he went to call his family and neighbors. Everyone was amazed. The newspapers were called and some ran the story. Mr. Ohtsu’s wife tells of a similar experience. She knocked over a kerosene stove. To her great relief, no fire broke out. Chills went down her spine when she later found that the stone had once again turned black. Her husband actually took some pictures of the blackened stone and you can see what looks clearly like a hand print in them . A few hours later, they say, the black faded away. The Migawari Amida is also renowned throughout the prefecture for helping get rid of ODEKI, which are tumors or pusy fistules. These days it is also believed to be efficacious for traffic safety. Devotees take a pebble from the shrine and keep it for one year before returning it. There is an interesting legend related to the origin of this allegedly MIRACLE WORKING STONE. In the days when Hanamuro-Jo still stood, one the Lords of the Castle, Ohstu Nagato no Kami, was burning up with a high fever. His vassals were in a panic, and prayed fervently for the intersession of the Gods and Buddhas. Delirious, the Lord had a dream. A voice called to him. “I am the God which protects your family. I will take on all that ails you. Tomorrow, go to the well where the horses are washed on the drilling ground”. When he revealed his dream to his retainers the next day, they rushed to the well. When they peered down into it, they saw something glittering brightly below. They pulled out the stone, and enshrined it on the hill. 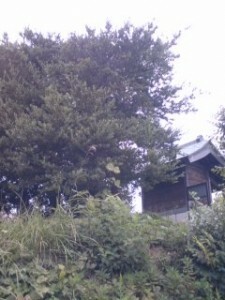 Behind the shrine is an old tree, a descendant of a tree which stood by the shrine before the Tokugawa Period. This tree is considered an Important Natural Heritage (Tennen kinen butsu, 天念記念物） by Ibaraki Prefecture. This is the first of a three part series for Tsukublog focusing on the little known HANAMURO-JO (花室所). Hanamuro-jo and MIGAWARI AMIDA (the Scapegoat Amida), I knew for the first time. Stone! Very sophisticated way of scape-goating. especially instead of to use live goat or sheep like ancient Middle east, or live human beings in every ancient countries, In Japan so called the first ruler Himiko(卑弥呼：female ruler in early 3rd century, in Yamato:大和=Nara or Kita-Kyusyu there still big argument about location) died with her 100 slaved servants live-buried ,they were some kind of Hitomi-gokuu(人身御供：human-sacrifice). Ema(絵馬):wooden plate with roof and with horse picture was originally scape-goating thought, instead to present live horse for god Ema was presented, to pray for success of one’s entrance examination of any schools, Ema-presenting are popular in many shrines in Japan, Yushima-Tennjin(湯島天神) in Tokyo-Yushima is the most famous, because of its god, very famous great Heian-era scholar Sugawarano-Michizane(菅原道真845-903), my last office was located there so I visited the Tenjin quite often.The area there are so many Hotels for lovers (ラブホテル：LOVE-HOTEL), very curious, it was said in Edo-era there were so many houses of mistresses of rich merchants and Samurais, also many Ochayas(御茶屋：meeting places), after Meiji to now so called LOVE-HOTEL business. I don’t think those lovers present Ema for good Luck for whatever!? In Nihonn-Syoki (日本書紀) it was written about scape-goating of cattle horse in6-7centuries. From around that time they have been using imitations. Livestocks were too expensive in Japanese soil. And now a day Emas not only cover the picture of horse but also 12 horary sings etc too. Among them horse are most popular. 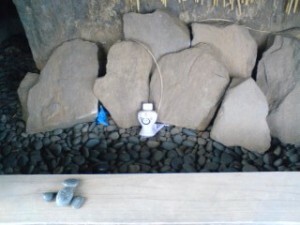 Anyway next time I go Hanamuro-area I will pick good shape pebble to pray my knee and for lever. Those are my weak point. Also I would like to think about Oda-clan, Satake-clan and Tsuchiya-clan and their age. Shinran,very famous priest for Aimida beleif:founder of Jyodo-Shinnsyu(浄土真宗） in 12century used live Kasama and wrote original of his famous lecture book Kyougyo-Shinnsyo(教行信証）. Namu-Amida-Butsu(南無阿弥陀仏：entrust on your hand,oh Budda). There was then, and might still be now, a nomiya of special note in the vicinity. Going past the Uenomuro intersection a few hundred meters South there is a huge sushi ya san. Turning just before that massive shop’s parking lot onto a very narrow road and then going a few meters one will notice on the immediate right a small, small, small shop. Diving into the small parking lot and then into the shop itself is like a trip down Alice’s rabbit hole. The O-kami makes mutsu ni komi to die for, the bar seats 10 regulars with open spaces for the very occasional new comer and there is a tatami area that has probably never been filled. The sound system is 8-Track Enka karaoki. Go. It will be good for you. Your posts have opened my eyes to many things which were oblivious to me previously. Since you posted about the torii gate, when I passed by a road, I noticed a small placard with the picture of the torii gate and the “please do not urinate here” written on it. All the time I didn’t pay attention to what is written but thought a shrine is somewhere nearby!